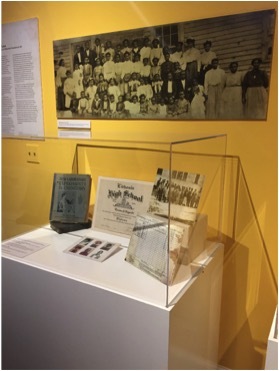 A new exhibit showcasing the history of Flat Rock, one of the oldest African-American communities in Georgia and a part of the Arabia Mountain National Heritage Area, is now open at the DeKalb History Center. Developed in partnership with the Flat Rock Archives, this exhibit displays artifacts gathered and preserved by the Archives from the 150+ years of the community’s existence. On display in the historic DeKalb County Courthouse, where African-Americans were once unwelcome, Deep Roots in DeKalb reveals a story of strength and ingenuity that continues to this day. From the days of enslavement to its rise as a close-knit agricultural community, Flat Rock thrived because of the selflessness of its leaders and the communal bond of its citizens. Flat Rock’s history begins in the early 1800’s, when settlers and enslaved people populated former Muscogee land. Following the Civil War, some African-American families remained in the community of Flat Rock, working together to ensure success and safety in rural Georgia. One of the local leaders, T. A. Bryant, Sr., was pivotal in ensuring the successful development of this African-American community, purchasing and providing land to local families. Though dogged by marginalization and animosity, the people of Flat Rock flourished. 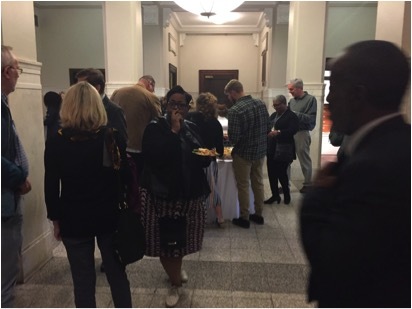 An opening reception was held on the evening of Thursday, February 28th at the DeKalb History Center. 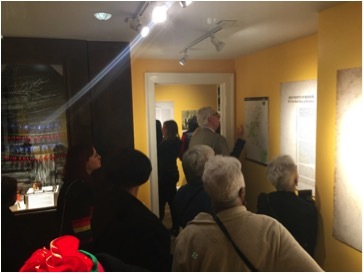 Staff of the DeKalb History Center, Flat Rock Archives, National Park Service and the Arabia Mountain Heritage Area Alliance were present, as well as members of the public and officials from DeKalb County and the cities of Decatur, Lithonia and Stonecrest. 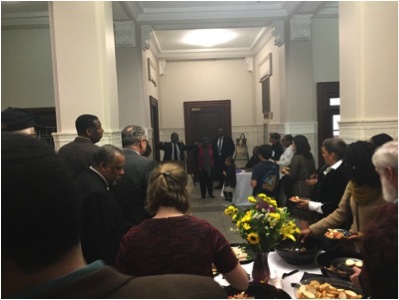 The Historic DeKalb Courthouse was packed with attendees for the opening of the two-year exhibit. 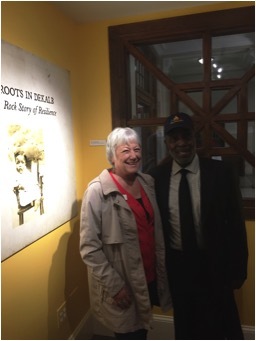 “Thank you all for coming to this Flat Rock history event,” Vera Whitaker, Co-Founder of the Flat Rock Archives, said at the exhibit opening. “Flat Rock has really grown,” she said, reflecting on the changes the former agricultural community has experienced over time: “We have no more cotton fields, we have no more farmlands there...but the Flat Rock Archive building is there,” referring to the historic T. A. Bryant, Sr. house, where the Flat Rock Archives are now based. 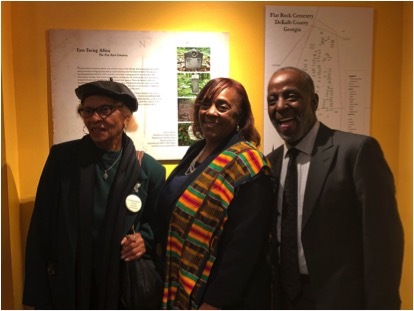 As the Archives continues its education and preservation work, the organization plans to use Deep Roots in DeKalb to raise awareness about this historically significant community right outside of Atlanta. 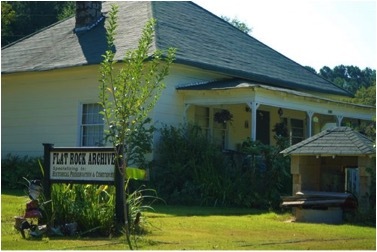 “The Flat Rock Archives will be at the DeKalb History Center once a month, starting in July,” said Johnny Waits, President and Co-Founder of the Flat Rock Archives. “We’ll be educating people about various aspects of the community, including farming, the historic slave cemetery, and many other topics.” Details for the monthly educational events will be finalized in the coming weeks. The exhibit at the DeKalb History Center will be up for the next two years, until February of 2021. Admission is free; History Center hours of operation are Mon-Fri, 10am-4pm and Sat, 10am-2pm. Visitors can learn more at the DeKalb History Center website and the Flat Rock Archives website. Visitors can also schedule a tour of Flat Rock here. The Arabia Mountain Heritage Area Alliance is dedicated to protecting, connecting and sharing the unique history, rich culture and engaging landscapes of the Arabia Mountain National Heritage Area (AMNHA) for the benefit and enjoyment of all. The staff and volunteer board of the Arabia Alliance work with partners across the AMNHA to ensure that everyone can benefit from the cultural and natural resources of the National Heritage Area. For more information, visit http://www.arabiaalliance.org.